Ever hear of a Google classroom? Probably not, unless you are a school teacher. Of course, you’ve heard of Google—it’s part of the world’s way to find something, anything, except, well, lost socks after the wash or your car in the mall parking lot when your electronic key is dead. A Google classroom has been running at Centennial for over a year and it is changing the way students approach and react to literacy. Lisa Harrison, an English and ESL teacher here, loves Google Docs. She uses it in place of the paper work and she does everything possible to be paperless with her students. The benefits are enormous, she says, since there is continuity for the students and teacher. By this she means that student work isn’t lost, but is easily transferred to the home computer. There is a familiarity about this method for students that feels familiar wherever they are at. This week, she took her students out on the grass, in the field near the Mitchell’s house and had them experience the grass, the wind, the sun, all things that related to the story “Dandelion Wine” by Ray Bradbury, which they are currently reading. They took out their—not laptops, but—paper journals and started writing. Most of the students snuggled into their favorite writing position on the grass and put the pen to the paper. At about 20 minutes, the students were mostly done and were getting restless. They picked up their pencils and notebooks and headed back to the classroom. Upon entering, they pulled out their Chromebooks from the cart and continued writing, responding and ending with Quizlet work with vocabulary and spelling. What was amazing was that the normally difficult job of getting students to write in their notebooks was overcome! All the fine motor skills difficulty of holding a pencil and writing for an extended about of time, were largely a non-issue. 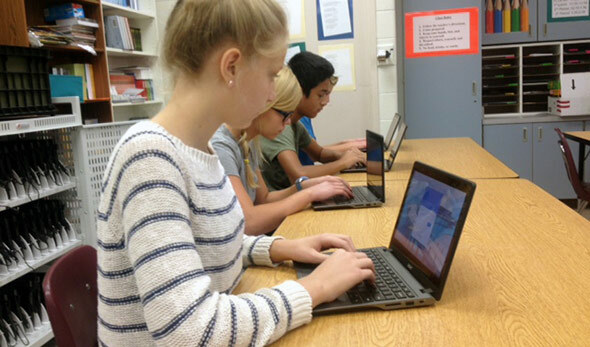 Mrs. harrison believes that because the students each have their own laptop each day, connecting to their own Google docs account, among other programs, they have become comfortable writing as a daily activity. Many writers have advocated that to be a writer, you must write every day. Here is proof that writing everyday is making them better writers. With this generation of digitally comfortable students, it is a natural fit to pull out their Chromebook and in a few easy steps, jump onto the site with all their work waiting for them, inviting them to add to the writing and express themselves in what has become a natural, easy way. In addition to the Chromebooks, Mrs. Harrison uses Nearpod, an application to present general instruction directly to the students on their laptops. Students also can present to each other in the same way. Sharing work with the teacher is easy, intuitive and dare we say, fun? For many years, decades even, finding ways to give timely, even immediate feedback has been difficult to impossible. Performing arts classes, like ballroom dance, band, orchestra and theater, have shown that they are where all the other disciplines want to be for feedback, tier 2 instruction (reteaching). However, with the Chromebooks, a Macbook pro and a Promethean board, Mrs. Harrison has rethought and reshaped how students approach, view and learn the curriculum in English. Not to be outdone, though, Mrs. Debra Herbert has been using the same technology in her science classroom to present material, take quizzes (that are graded in real time) and save work to. Students can immediately see how they have done on work handed in. A class scatter plot of scores lets Mrs. Herbert know what she needs to reteach at that moment, rather than waiting until later when the moment of greatest interest for the students is passed. Mrs. Hervbert also uses clicker remotes to collect data (interactive remote controls) which she hopes to replace with the functionality of Chromebooks soon. 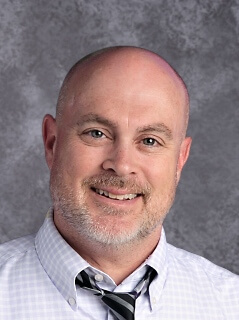 Getting everything on the Chromebooks helps solidify the learning experience as it becomes a multitool, rather than having to go back to the toolbox every time a clicker, a Chromebook , a pencil or other learning tool is needed. It cuts out distractions and streamlines the learning and reporting process, which speeds up the teacher’s grading time. This leaves time for more preparation, better presentation of material and more immediate, positive feedback. One away to immediately help students Mrs. Harrison and Mrs. Herbert, is that when students are using Google docs, each teacher can see in real time what the students are writing and can give immediate feedback, even while the students are in the act of writing! This is helpful for the teacher, since when they start making suggestions on documents the students are writing or editing in real time, they can correct errors before they stagnate on the page. It is a little funny to see the student have a mild freak out moment when they realize that they are not alone in their Chromebook world and the teacher is invisibly making changes on their page. It is a little jarring at first, but they just look at the teacher and smile.It is almost always appreciated. Students know the teacher is there with them, helping, guiding and mentoring. At that point, google docs, Chrome, Quizlet, Promethean boards, Macbooks and all the other tools fade away to reveal a teacher who loves to help a student learn. And the student responds by showing what they’ve learned and that they have a thirst for more.